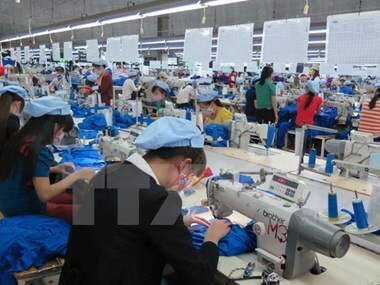 Hanoi (VNA) – Major membereconomies of the Asia-Pacific Economic Cooperation (APEC) forum, including theUS, Japan, the Republic of Korea (RoK) and China, could make up 74-75 percentof Vietnam’s total garment-textile export turnover in the coming time. Director General of the Vietnam National Textileand Garment Group (Vinatex) Le Tien Truong said this year, the apparel sectorcontinues to maintain good growth in the four APEC markets and the EuropeanUnion (EU). Vietnam’s apparel export to the US has increasedby about 6.5 percent so far and is expected to reach approximately 13 billionUSD this year, accounting for 13-13.5 percent of the market shares. Truong said before 2016, Vietnam had only fourbillion-USD markets, namely the US, Japan, the EU and the RoK; however, thisyear China has become a key market of Vietnam. He noted that Vietnam’s garment-textile exportsto China increased 30 percent to hit 670 million USD in the first eight monthsof 2017. Countries from the Eurasian Economic Union(EAEU), including Russia – an APEC member – recorded growth of 90 percent.Export to Russia is likely to surpass 200 million USD in 2017, making thecountry one of the top 10 garment-textile markets of Vietnam. Pham Xuan Hong, President of Ho Chi Minh City’sAssociation of Garment, Textile, Embroidery and Knitting, said Russia isexpected to be a billion-USD market for the apparel sector in the next 4-5years. He suggested businesses developing markets inthe Association of Southeast Asian Nations (ASEAN), the Eurasian Economic Union(EAEU), and India. Chairman of the Vietnam Textile & ApparelAssociation Vu Duc Giang said the expansion of markets should go with thedevelopment of technology and brand names to create more competitive productsin the global arena. According to the Vietnam Textile & ApparelAssociation (VITAS), the garment-textile exports earned 23 billion USD in thefirst nine months of 2017. APEC, potential market for Vietnam’s garment-textile have 315 words, post on en.vietnamplus.vn at 2017-11-15 07:58:11. This is cached page on VietNam Breaking News. If you want remove this page, please contact us.